All events happen at the birth center, unless otherwise noted. Most classes and events require registration. Sign up by clicking the button at the end of each section. It will take you to a new page. When you're done, close that page and come back here to sign up for your next class. If a class is full or unscheduled, let us know your needs with the buttons provided. Questions? View our Staff Directory or call us at (505) 924-2229. You must use our system to sign up for classes. Do not call with these requests (unless absolutely necessary). Thanks! After you attend your Tour (see below for more information) and you sign up for your care with Dar a Luz, you'll be ready to start taking classes. Then, sign up for your Pathfinder: Dar a Luz Classes and Services class (see below). In this class you'll find out about all the other classes and have a chance to register for them. You’ll get an overview of what to expect during pregnancy, labor, birth and postpartum care at the birth center. You’ll learn how to make the most of your experience at Dar a Luz. You’ll also meet some of the teachers, and other parents-to-be. This class is highly recommended for all Dar a Luz parents. Please take this class before you sign up for your birth class series. You can sign up below. Sign up for all of your classes! Keep scrolling to find out what classes are required and suggested. Wondering what classes you're required to take? We require these classes because we truly see a difference in our families' births and experiences when they learn these skills and ideas. Some of these classes are important because learning this general information in a group setting frees up your clinic time to focus on your personal experiences and needs. We know that the education we give to our clients is above and beyond what most parents are offered in their care at other facilities, so we work hard to make sure that our clients find classes relevant, interesting, and fun! You are also strongly encouraged to attend the same classes we require for first-time parents. We have some amazing classes! Explore our support groups... they are free and open to the public! You can sign up for classes by clicking through to our online scheduler. Most classes are included at no additional charge for birth center parents. Most of our classes are available to the greater community, too, for a fee. The dates below are organized by class type. Please view our live calendar below for another view. If this is your first visit, you might find it more useful to go class by class, below, so you can learn about each topic. Usually offered the second and third Saturdays each month, at 10 a.m. unless otherwise noted. Allow about 1.5 hours. *Note: there is no December 21 Tour. There are some important things for you to know before you come to a tour! Click below for more info. We have a variety of childbirth preparation classes for birth center parents. All birth center moms must attend one birth class series. Wondering which birth class to take? Check out our Class Descriptions page for more information on each class. Meets five afternoons, for 2.5 hours each time. This class is available to non-birth center clientele as well, for a $300 fee (no tax, payable to Dar a Luz). Taught by childbirth education expert Amity McElroy. Read about Amity on our staff page, or contact her directly on our contact page. First-time Dar a Luz moms have the choice of this class or the Blissborn class (below), included in your birth center fees. For more information on our classes, go to our Class Descriptions page. We strongly recommend taking these classes week 28 or later. from 3:30 to 6:00 p.m.
To get on the waitlist for full classes, or to be informed when we schedule more classes, click on one of the buttons below. Meets five Tuesday evenings from 6 to 9 p.m. *Extra fee for materials is $75 plus tax, payable to Laura in the first class (for both Dar a Luz clients and non-clients). This class is available to non-birth center clientele as well, for a $300 fee (no tax, payable to Dar a Luz), plus the materials fee. Taught by Blissborn founder, hypnotherapist, and childbirth educator Laura Wood. Read about Laura on our Staff page, or contact her directly here. First-time Dar a Luz moms have the choice of this class or the Dar a Luz class (above), included in your birth center fees. For more information on Blissborn classes, go to our Class Descriptions page, and download a free 10-minute relaxation on the Blissborn website here. We strongly recommend taking these classes week 28 or later. April 23 through May 21 from 6 to 9 p.m.
(This class is full. If you need to get in to this class, please contact Laura directly. This class is for women who have given birth before. The Condensed class is not designed for mothers who are not birth center clients, or who are first-time moms. If you are having trouble finding a class to fit your schedule, or if you have extenuating circumstances, please contact the class teacher or talk to your midwife to discuss. Taught by Robin Hayter. Read about Robin on our Staff page, or contact her directly on our Contact page. For more information on our classes, go to our Class Descriptions page. We strongly recommend taking these classes week 28 or later. This class is offered one Saturday each month, from 9 a.m. to 1 p.m. Bring your lunch! After you look at the required classes, click the button below to sign up for each one....or sign up for a class, a waitlist, or a "callback" using the buttons provided after each class description. This class is required for all Dar a Luz moms. Learn what happens when birth doesn't go as expected. Hear from key birth center personnel who help before, during and after a transfer. Meet past Dar a Luz parents who experienced a transfer from the birth center to the hospital and listen to their story. Get your questions answered and find out how to minimize your chance of transfer. This class is offered once a month, every month, and we suggest taking it between your 5th and 8th month of pregnancy. There's no additional charge for birth center clients, and we even provide dinner! Dinner served from 5:15 to 5:30 (we serve Dion's pizza and salads, with meat, turkey, vegetarian, vegan and gluten-free options always available; please email Laura at least 24 hours in advance if you have other dietary needs). To get on the waitlist for full classes, click on the button below. Compared to other mammals, our newborns are born immature and fragile. The first 3 months after birth are often called the fourth trimester, as newborns unfold, "wake up," and start developing into the unique individuals they will be. In this class, learn what makes newborns "tick," how to figure out what your baby needs and understand her/his communication cues. Learn about normal newborn behavior and appearances and what to do if something doesn't seem right. We will focus on the basics like diapering, holding, swaddling (bring your own blanket), and burping. Most of all, learn how exciting and wonderful your new little family member will be and how to fully enjoy these early days. Required for first-time Dar a Luz parents; recommended for all parents attending Dar a Luz birth classes. Taught by Amity. Register to take Amity's newborn care class before or after your birth class series. Pick one that fits your schedule and be sure to get it in before the baby is born! Please bring a newborn blanket to work on your swaddling skills. Included in birth center care (click "Pay Later" during sign-up) for Dar a Luz clients. Cost of class is $30 for each mom or couple (non-clients). Pay by credit card at sign-up, or by cash, check (made out to Dar a Luz), or charge at class. Classes are on Sundays, and are 3 hours each. You now also have the option of deepening your knowledge, in our new class "Babies: Beyond the Basics" (see below). Register to take Amity's breastfeeding class before or after your birth class series. You can also come after your baby is born, but we recommend coming before. Included in birth center care (click "Pay Later" during sign-up) for Dar a Luz clients. Cost of class is $30 for each mom or couple (non-clients). Pay by credit card at sign-up, or by cash, check (made out to Dar a Luz), or charge at class. May 19, from 11 a.m. to 1 p.m.
June 2, from 1 to 3 p.m.
July 7, from 11 a.m. to 1 p.m.
August 11, from 1 to 3 p.m.
September 8, from 11 a.m. to 1 p.m.
October 6, from 1 to 3 p.m.
November 3 from 1 to 3 p.m.
December 8, 2019 from 1 to 3 p.m.
Also check out "Pumping Basics" below, offered regularly and taught by Amity. For more support and socializing, check out the New Parents Support Group and our breastfeeding groups every Wednesday morning and two Wednesday evenings each month. Free to all, including our larger community! Facilitated by our staff nurses, midwives and peer counselors. More information in our Support Groups section below. You can come before or after your baby is born, but we recommend doing it before, to ensure that your car is ready to drive your baby home from Dar a Luz. Please register! Sunday, April 28 from 12 to 3 p.m.
Sunday, May 26 from 1 to 4 p.m.
Sunday, June 9 from 12 to 3 p.m.
Sunday, June 23 from 12 to 3 p.m.
Sunday, July 14 from 12 to 3 p.m.
Saturday, August 3 from 1:30 to 4:30 p.m.
Sunday, August 4 from 12 to 3 p.m.
Sunday, September 8 from 1 to 4 p.m.
Sunday, September 15 from 12 to 3 p.m.
Sunday, October 20 from 12 to 3 p.m.
Saturday, November 16 from 12 to 3 p.m.
Sunday, December 1 from 12 to 3 p.m.
Saturday, December 7 from 1:30 to 4:30 p.m.
To be informed when we schedule more classes, click on the button below. Attendance in these classes is optional but highly recommended. For most of them, there is a fee for birth center and non-birth center clients, as noted. After you look at the bonus classes, click the button below to sign up for each one...or sign up for a class, a waitlist, or a "callback" using the buttons provided after each class description. Sign up for this one after you are a birth center client -- it's free for our clientele. Jointly taught by our birth class teachers, this class will answer your most pressing questions and give you essential information about your care at Dar a Luz. You'll also have a chance to learn about and sign up for all your classes. Wondering which birth class to take? After this class, you'll know! Take this class before your 5-week class series, as early in your Dar a Luz care as you can. Saturday, May 18 from 4 to 6:30 p.m. Recommended for all parents attending Dar a Luz birth classes. While Newborns Head to Toe (see above) is required for first-time moms (and recommended for everyone), this class is optional, and can stand alone. Take after Newborns if possible; you may also take it before, if needed. Taught by Amity. Cost of class is $30 for each mom or couple (both clients and non-clients). Pay by credit card at sign-up, or by cash or check (made out to Dar a Luz) at class. May 19 from 3 to 6 p.m.
July 21 from 12 to 3 p.m.
October 13 from 12 to 3 p.m.
December 8 from 3 to 6 p.m.
Take this two-hour class to learn the basics of pumping and storing breast milk and bottle feeding it to your baby. Learn how to clean and care for your pump. Best in your third trimester or after the baby comes. Bring your pump if you can! Led by Amity McElroy or Robin Hayter. Non-Dar a Luz clients: Cost is $30 per mom or couple. Pay by credit card at sign-up, or by cash or check (made out to Dar a Luz) at class. Keep going! Below the live calendar we have even more great stuff! Special Events and Support groups below. Use this calendar to find the classes you want. To register, scroll to the class description on this page and use the "Sign up" button under it. Note: the calendar is subject to change at any time. We will notify only those who are registered for a class if it is changed. We are proud to serve as a community resource for a wide variety of topics. Disclaimer: Most of the special events below are set up and led by community members -- not Dar a Luz staff members -- and as such, they don't necessarily reflect our beliefs as an organization. Dar a Luz is not responsible for their content, and does not necessarily endorse every aspect presented. After you look at the bonus classes, click the button below to sign up for each one....or sign up for a class, a waitlist, or a "callback" using the buttons provided after each class description. Learn about the doulas who serve Dar a Luz moms. These dedicated, compassionate women are on call 24/7 to help Dar a Luz families who are transferred during labor, and they are also available for private hire if you know you want a doula no matter what. Come and meet them, find out all about doulas and the services they provide, and enjoy a good cup of tea. Doula Teas: Join us for some tea, and meet our doulas. We'll help you learn more about doula care, so you can explore your options. You can view this as an "orientation" to what we offer. This occurs in the first hour of the meeting. Doula Client Workshops: For our doula clients only. Learn more about our doula services here. This occurs in the second hour of the meeting. Please let us know you're coming -- you can RSVP below (but drop-ins are OK too). Amity is certified through the International Institute of Infant Massage. Numerous benefits for babies and caregivers include increased bonding and relief from lots of complaints and stresses. Babies of any age are welcome, but babies who are at least 8 weeks old will tolerate a longer massage. Older babies and toddlers are welcome too! Bring any oil or lotion that you use on the baby. Amity recommends organic cold pressed oils such as olive, coconut, almond, grape seed, or apricot kernel. Please bring a check (payable to Dar a Luz Birth & Health Center) or exact change. Cost is $15 per mom or couple (bring exact change if paying with cash). You can also pay during the sign-up process (preferred). August 25 from 10:30 a.m. to 12 p.m.
November 17 from 2 to 3:30 p.m.
Join firefighter Kris Romero in a certification course in Infant, Child and Adult Cardiopulmonary Resuscitation (CPR). Learn basic life-saving measures, what to do in an emergency, and how to be prepared. Cost is $40 per PERSON. Due to space and materials, each person attending must register here, and then pay the $40 fee at the birth center. To complete your registration, drop off cash or check, payable to Kris Romero. You may mail a check (allow 7 days) payable to Kris Romero, mailed to Dar a Luz, 7708 4th St. NW, Los Ranchos, NM 87107. Watch for our next one and sign up fast! These usually fill quickly. Monday, April 29 from 6 to 8:30 p.m. Learn about how the amazing female body changes to accommodate pregnancy and delivery. Genevieve Richter, a local pelvic floor physical therapist, will educate you on these changes and provide exercises that you can do during pregnancy and postpartum to help optimize recovery, and prevent injury. Space is limited for this class! Save your spot by signing up below. $10 donation requested (sliding scale available). Led by licensed mental health counselors, lactation consultants, and Dar a Luz moms and dads, midwives and RN birth assistants, our groups grow and thrive organically. Groups meet on a regular schedule so you can plan ahead. People often question whether their experience qualifies them for a "support group," but these groups are for everyone -- all experiences welcome. Telling your story is an important part of moving through it. Come do it in a safe place with caring people. Call us with questions and suggestions! All of our groups are free and open to the community. No registration is required, but we appreciate it when you RSVP, to help us know how many chairs to set up beforehand! Facilitators may leave early if there are no participants in the first 20 minutes. Please arrive near the start time but feel free to leave whenever you need to. After you look at the support groups, click the button below each group to RSVP (never required, but greatly appreciated). Second Thursday of every month from 6 to 8 p.m.
First Friday of every month, from 12 to 2 p.m. Available the fourth Thursday of every even-numbered month (February, April, etc.) from 6 to 8 p.m., unless otherwise noted. Scheduled weekend days most months, each time at a different local brewery or distillery. Watch for the next one! Dar a Luz does not advocate or encourage the abuse of alcoholic beverages. Please drink responsibly and in moderation. Please RSVP below, and we'll get in touch with you with directions and more info! To be informed when we schedule more of these groups, click on the button below. This is a dads' and other partners' hiking group, set up and run by some of our Dar a Luz dads. Usually meets monthly. Watch Facebook for these events! This is a chance to get back together with your five-week series (Dar a Luz or Blissborn) birth class after everyone has had their babies. Set this up with your birth class instructor! Available the fourth Thursday of every odd-numbered month (January, March, etc.) from 6 to 8 p.m., unless otherwise noted. Thursday, May 22, from 6 to 8 p.m.
*NOTE: Please set these up with your birth class teachers. We must have RSVPs for these! Join Kimberlee Maresma, LPCC and Jose Maresma, Mindfulness Teacher: a husband wife team that teaches Mindfulness skills to individuals, couples, families and groups. This workshop is specifically designed to help partners recapture, build and strengthen intimacy. This mini-retreat will leave you feeling renewed, hopeful and full of joy. $100.00/couple, payable that day. Limited to 10-12 couples. We're sorry! Due to poor attendance, we're no longer scheduling this group. 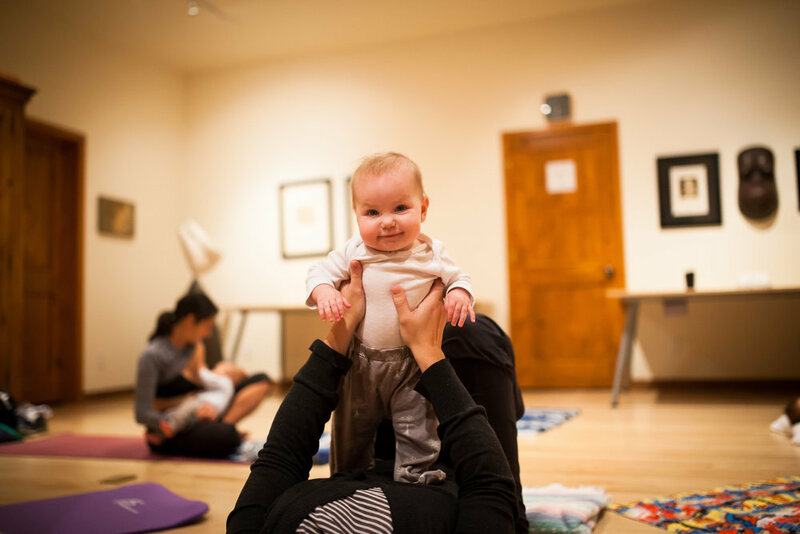 We are pleased to announce that Mom & Baby Yoga is returning to The Remedy Day Spa on Saturday, June 16th at 3 pm. View our interactive yoga calendar to sign up! You might also want to check out free prenatal yoga classes, which are a benefit of joining the Lovelace Labor of Love Program. These free prenatal yoga classes are exclusively held at both Lovelace Women's Hospital and Lovelace Westside Hospital in Albuquerque. To sign up for free Labor of Love prenatal yoga classes, click here or call 505.898.3030. Did you know that all children are musical? Join Terrie Galacia of Sing and Swing Southwest for a fun and interactive free demonstration Music Together class. Grown-ups and babies will sing, dance and play together, in addition to learning how music can be a powerful way for you to bond with your child. Terrie is a Board Certified Music Therapist and music teacher with more than 10 years of experience providing music therapy and Music Together classes for infants and children. Music Together is an internationally recognized early childhood music and movement program for children from birth-age 5 and the grown-ups who love them. Participants should wear comfortable clothes and bring a blanket for baby to lie on the floor for part of the class.